Regency Hotel Management has a mixed portfolio of both hotels and resorts, as well as both urban and rural locations. Our data is a mix of 39% hotels and 61% resorts, and emails were sent to both the leisure (80%) and planners (20%) segments. According to industry benchmarks, the hospitality industry has an average email open rate of 20.39% and a CTR of 2.22%. In comparison, the Regency Hotel Management portfolio has an average open rate of 22.95% and a CTR of 11.21%. 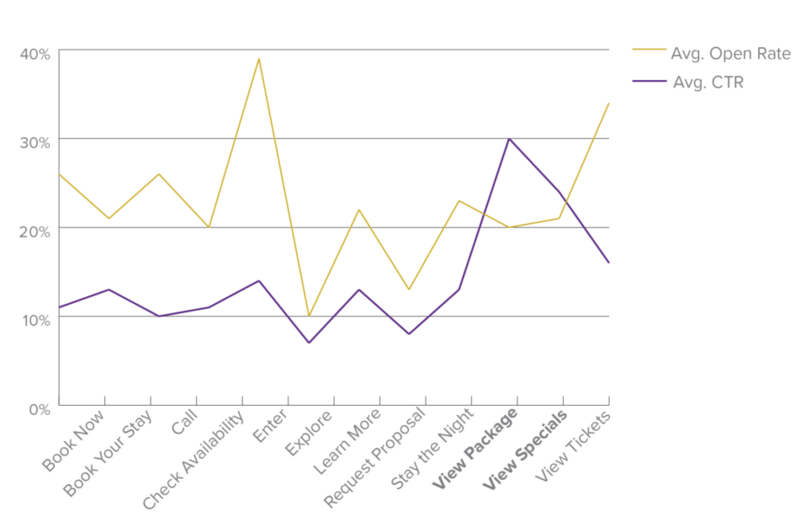 Figure 1: Regency open and click-through rates compared to hospitality industry benchmarks. We saw the best open rates happen on Monday for both hotel and resort properties. Resorts also saw high open rates on Saturdays. Why Monday? This is likely a psychological effect. When starting the work week, planning a getaway might seem like a better option than diving into work responsibilities. Across all properties, we tested 14 different send times throughout the day—with one clear result. Six in the morning and six at night generated the highest email engagements, and this was true for both hotel and resort properties. What Calls to Action Work? How many calls to action? How many calls to action (CTAs) are too many? We tested emails with one to six CTAs. Success for these emails was revenue, not engagement. As a result, when we analyzed these CTAs we did not focus on open rates or CTRs, but instead on the online bookings generated. By looking at the revenue generated per email sent compared to how many CTAs were included in the email, the top revenue generator was 3 calls to action, followed by two. Providing a few ways to reach the website prevents readers from missing your CTA, without overwhelming them. 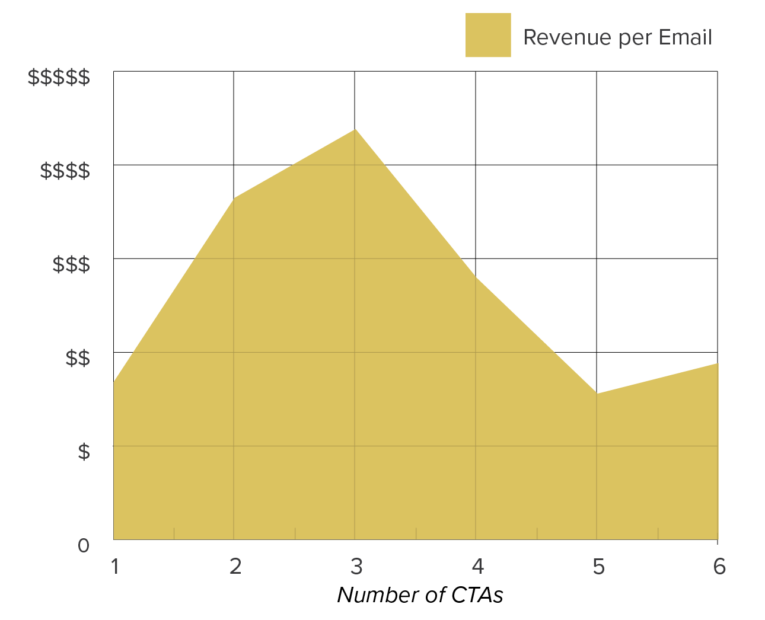 Figure 2: The number of calls to action in an email compared to the revenue generated by the email. The term that works best depends on which goals are being tracked. For our purpose, our primary focus was generating online booking revenue from emails. Though a variety of CTAs generated revenue, the two main terms tested during the time period were “Book Now” and “Check Availability”. 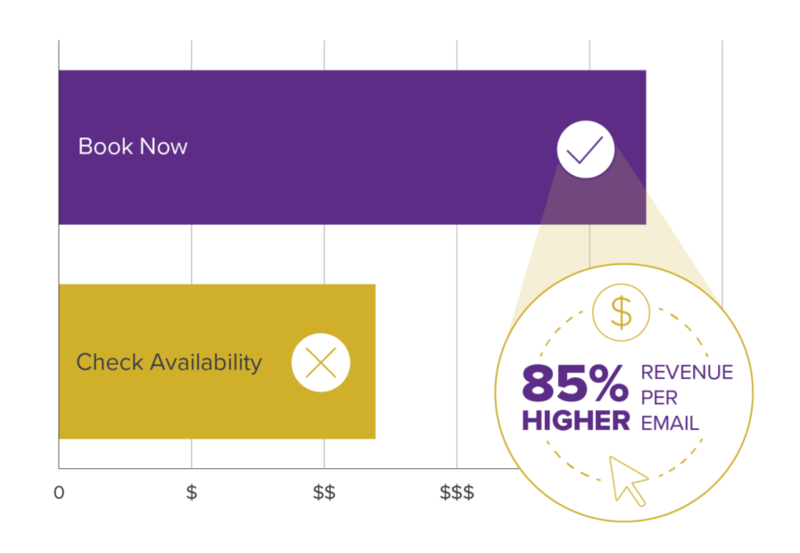 Looking at revenue generated per email send, “Book Now” generated 85% more revenue than “Check Availability”. Depending on the goal of your campaign, different CTAs might work better. For example, CTAs like “View Specials” or “View Packages” generated the highest CTRs, however, they did not result in booking conversions. These CTAs will perform best if the goal is to drive visitors to a website, as they are less committal. Figure 3: "Book Now" generates 85% more revenue on average than "Check Availability". Figure 4: Calls to action affect open rate and click-through rate differently. A subject line often determines if an email is opened. So what works best for the hospitality industry? It depends on who you’re sending it to, the promotion, and the seasonality. If you are sending an email focused on meetings and events to a list segmented for meeting planners, use “plan” or “planning” in the subject line. When these terms were used in an A/B test for meetings and conventions emails, it was the winning subject line 85% of the time. If you are sending a leisure email, however, do not use “plan” or “planning” in the subject line. Hotels want to inspire relaxing vacations and getaways, so don’t lead with the work and planning that vacations take. When those terms were used in leisure emails, the subject line only won 20% of the time. Including the property name in the subject line won 76% of the time. Remind subscribers of where they could be spending time and taking a trip away. Using the property name won consistently across leisure and meetings segments, as well as with both hotels and resorts. Ex: Summer isn’t over. Vs. Summer isn’t over at [Property Name]. Just as the property name inspires a destination, so does the name of the city. When the city name was used in the subject line, it won 83% of the time. Remember that subscribers do not always remember all the email lists they are on, so be descriptive and remind them who are you right away. Ex. Jingle all the way to Sioux Falls vs. Thinking about holiday shopping? For the hospitality industry, the percentage off didn’t entice people to open the email. When it was included in the subject line (for example, get 20% off), it lost 65% of the time. There are times when it could work, but use the property name or city name if you can. It promotes an experience rather than a strict discount, and you can always sell the package discount within the body of the email. Every property is unique, but these email insights have helped us to continue generating more online bookings directly from email year over year and to engage with email subscribers, creating loyal long-term guests. Data compiled and originally posted by Click Rain.